Since we in the U.S. are enjoying a long weekend, you got extra time to establish a Best Bird of the Weekend. Did Monday morning birding make a difference? While I saw plenty of cool birds this weekend, including at least 10 Common Nighthawks, I was most engaged by a veritable swarm of Cedar Waxwings skimming along the surface of a pond for flies like swallows. 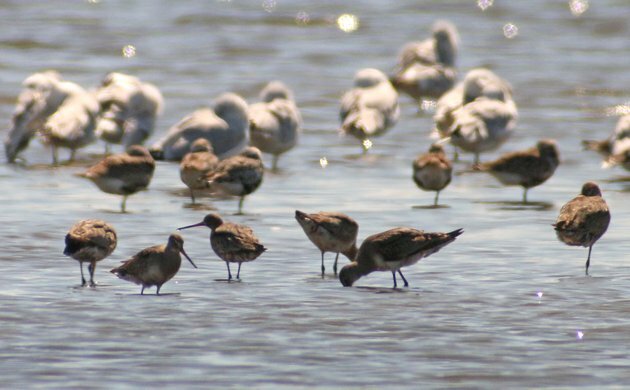 Corey got into some great shorebirds and hungry muck at Jamaica Bay, where a group of Hudsonian Godwits proved well worth the cost of a boot full of mud. How about you? What was your best bird of the weekend? Tell us in the comments section about the rarest, loveliest, or most fascinating bird you observed. If you’ve blogged about your weekend experience, you should include a link in your comment. This morning at the local state park was very disappointing–no shorebirds, no ducks, not even a House Finch or a Red-winged Blackbird! Not sure why things were so quite. Very spring like at the moment, with lots of New Zealand Pigeon pairs to be seen. But I think the best was a Black Swan, the first I’ve seen in Karori. While hiking @ the Schuylkill Center for Environmental Education in NW Philly, my husband and I got buzzed by a Great Horned Owl! We would never have noticed it except for the godawful shrieking it was doing on a branch in the distance. Got it in the bins and it was staring dead at us, moving its head side to side, then it took flight (like South Park, “it’s heading right for us!”) and look out below! So sorry to have bothered it, but what a phenomenal experience with a truly majestic bird. This is one for the grandkids.